Search ALL Atlanta New Homes for Sale - Includes completed, under construction, or yet to be built homes. Builders have an on-site Builder's Agent representing them. Have The AtlantaPros Team representing you. Most of the time Builders use their own Builder's Attorney drafted contracts, which obviously are created to be in the builder's favor. You NEED to have a Buyer's Agent representing you. And why wouldn't you - a Buyer's Agent is FREE to you! 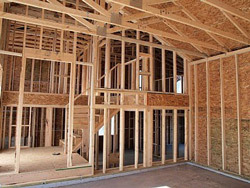 Note: There are many caveats as well as "rights" that you need to know before purchasing a new home through a builder. While many builders are simply interested in providing a great product for a fair price, diligence and experience is needed when signing builder contracts to avoid costly pitfalls. We will be by your side to guide you and protect your interests throughout the entire transaction. After we collect all of your specific needs and wants, then we'll research dozens of public and agent-only resources to gather a comprehensive list of new homes, communities and builders for you to consider. Next, we'll take you to see homes in your potential communities, share our experience working with the different Atlanta home builders - both good and bad, and then help you narrow down your list to your top picks. At this point, we will work with you and the builder's agent to get you all the information you need to decide which community and home design is best for you and your family. We then will help you negotiate features, add-ons, and pricing to assure you're getting the house you want for the best possible price. We look through builder contracts and if necessary speak with our own real estate attorneys to assure your rights are protected. Upon writing a contract, we will work with you and the builder to walk you through the steps of completing your home, assuring all your feature selections are properly included and aesthetic issues are corrected as they come up. We'll help you find your own personal home inspector to come out during the construction process and for final inspection to assure your home is completed properly (you should NEVER rely on over-burdened county inspectors to consistently find all potential issues during your home's construction). Upon final inspection, we'll sit with you at the closing table to make sure your loan is closed with the rates and costs promised and that there are no issues that are not corrected before finalizing your new home purchase. The top 20 is based on the number of Atlanta new homes closed in 2012.